The golf ball has undergone many enhancements over the years from the original wooden ball to the modern rubber core. Today, golfers can choose from a variety of golf balls to fit their individual needs and preferences. Some balls go farther off the tee, while others promise better control with iron shots. Soft-cover golf balls are thought to make it easier to put spin on the ball with wedge shots. 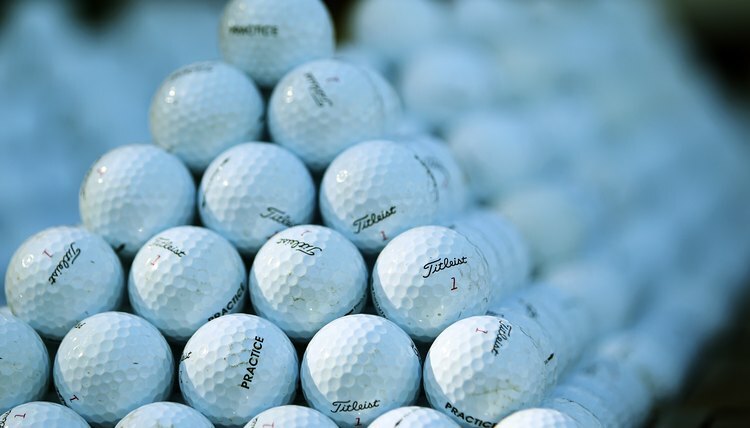 This technological revolution in golf ball manufacture spanned nearly 400 years. If you were out for a round of golf in Scotland in 1550, you would have hit a wooden ball with a wooden-headed club. These early balls are thought to have been made from beech, box root or other hardwoods. The featherie ball, introduced in 1618, was made of pieces of horse or cowhide tightly stuffed with goose feathers and then sewn together. Both the leather and feathers were wet during manufacturing. The leather shrank as it dried and the feathers expanded--forming a hard compacted ball. Making featheries was a time-consuming process and the balls were very expensive. Because the featherie was easily damaged when struck, golfers continued to prefer wooden-headed clubs instead of forged iron heads, because woods caused less damage to the golf balls. The next major golf ball innovation would take more than 200 years. The Gutta Percha ball or “guttie” was introduced in 1848. This ball was made from the rubbery sap of a tropical tree, which could be formed into a sphere when heated. The guttie cost much less to make than the featherie. A sharp-edged hammer was used to imprint a pattern on the ball, which gave it better flight characteristics. By 1890 the gutties were manufactured in molds, which brought the cost down further. Soon, rubber companies such as Dunlop got involved in the mass production of gutties. Gutties were often made with spherical bumps across their surface, called the “Bramble” pattern. The improved durability of the guttie, when compared to the featherie, allowed golfers to include iron-headed clubs in their bags more often. Coburn Haskell created the next important golf ball innovation in 1898 when he introduced a ball made from a solid rubber core with rubber thread wrapped around it, and encased in sphere made of gutta percha. These balls were immediately popular because they added 20 yards to most players’ shots off the tee. The invention of a thread-winding machine facilitated the mass production of the Haskell ball. The dimpled pattern we see on golf the covers of balls today, which improves ball flight, was first used in 1905. In 1972, sporting goods manufacturer Spalding came out with the first two-piece ball under the brand name The Executive--this was the only major improvement in the basic Haskell design until that time. In the 1920s and 1930s, the major governing bodies of golf, The R&A and the United States Golf Association (USGA) began issuing standards for the size and weight of a golf ball. From 1931 to 1990, their specifications for the dimensions of the golf ball were different: a smaller-diameter ball was often played in Scotland, a larger one in the United States. Since 1990, a uniform standard has been in place.